The 2016-2017 girls' swim team is coached by Megan Kohnke & Ashley Fahey. The team consists of the following girls: Alexis Asunto-Ryan, Greenleaf Baker, Liana Bautista, Mackenzie Berlin, Cecilia Cabrera, Gabriela Casas, Michelle Casas, Natalie Claas, Lily Correa(Captain), Jade Durand-Husting, Nicole Falkowski, Hanah Glavan, Isabeau Goyette, Alexxus Hart, Maryann Jimenez, Sarah Klein, Kayla Moua, Riley Oberforf, Aida Reyes, Christina Rivas(Captain), Leslie Sandoval, Kayla Schulz, Abigail Stetter, Josephine Stevens, Ariana Veloz, Natalija Walker(Captain), Alexa Wasielewski & Rhiana Zaian. If your'e interested in joining the girls' swim team, contact Ms. Kohnke or Ms. Fahey. The swim team meets everyday after school from 3 p.m. until 6 p.m. Here at Ronald Reagan College Preparatory High School, there are opportunities that allow students to be more successful in college and beyond, with one of those ways being a variety of clubs offered after school . Clubs are a great way to earn scholarships, have something good down on your transcript, or even to just join something that best fits your interests. Have you seen students walking around with dark blue shirts and a wolf logo on it? Were you curious why they were wearing them? Well, no need to ponder on, you witnessed a staff member of the Husky Howler. The Husky Howler is a structured team that presents monthly “hard-hitting” journalism, creative pieces or artwork, school events, and advice on personal issues in the “Dear Nancy” column. The newspaper meetings are always informative and have an order as to what must be accomplished in the time allotted. Señora Moore, the teacher adviser, the two team Editors-in-Chief - Corinne Kronschnabel and Valerie Mecha - and other editors work hard to make sure everything runs smooth. The meetings are held every Tuesday from 3:00 - 4:30, and are usually supplied with concessions. Every member in the group is fantastic, very resourceful, helpful to get you on your feet, and filled with excitement for the overall process. If you’re looking for a place to report on school, local, or world news and/ or to be creative, then the Husky Howler is right for you. If you attended Reagan Fest recently, then you heard Radio Reagan. This club’s mission is to produce daily broadcasts accompanied by music from 7:00 a.m. to 7:30 a.m. each morning. This extracurricular allows members to learn music production and history, as well as communication skills. One sophomore member of Radio Reagan, Tristen Hyde, said that, “[while] I’m not going into a music career… many others from Radio Reagan are… and there are further opportunities, like College Radio, which is a big thing.” College radio is important if music is your career path, as it can gain you a Bachelor’s degree in music. If you’re intrigued to advance your career in music, make the morning announcements, or play songs every morning, then go to room 135 to sign up for Radio Reagan. If you’re skilled at playing chess - or even simply want to learn, then the Chess Club is meant for you. With the club Mr. Wood has set up, they have different levels for people that may have more or less experience with this game. Seth Kinney builds on how the different levels work, saying, “There’s one system where you come in on Tuesdays and play for fun, and another where you show up Tuesdays and Thursdays, and you’re playing more seriously.” While most of the time the club is held in the school library, the season ends with a State Chess Tournament that’s promised to be fun in the end. It’s a fun, small club to join if you’re into playing chess and meeting people that share that interest with you. The GSA, or Gay/Straight Alliance, is a place where everyone can come together and make new friends, talking to people that you wouldn’t usually talk to. The club meets up every Wednesday, and it is a great place to make more connections to different groups of individuals and do activities such as movies, games, and more; along with “Fun Friday’s” usually occurring near the end of every month. One of the two leaders, Carly Palacios, states that the members of the group will, “go over the history” and background on different sets of people, such as those who are straight, gay, lesbian, bisexual, and transgender. Along with Carly, a fellow student named Leonardo and staff member Mr. Moriarity have put a lot of effort into the planning of this year's objectives and activities for the club, and they are excited for the amount of new people that are joining. If you’re interested in joining a group that is an inclusive place for all kinds of people to interact with, then join the GSA. The debate team is one of the groups that stands out inside Reagan, having two outstanding leaders: Sam and Ben. According to Ben, debate is, “talking about policies that could be put into place… and how relevant they are to today’s societies.” They also mentioned that the debate team is a great way to improve public speaking and communication skills overall. Every year the topic that all debate teams focus on changes, and this year its overarching topic is, “the economic ties with China… [like] how China and the United States trade.” Sam added that another focus would be on, “space exploration... and if we (the U.S.) should do it with China.” As heard from other members of the group, it seems to be a great team of people that support each other and all their opinions. If you’re motivated to join the club, then go to Mr. Silva’s room in 202. Track is a great sport that has competition and true sportsmanship, as well as being a good way in general to keep your body in shape. With track, Timothy Manzke says that, “You wanna’ get your endurance up, that’s the biggest thing you wanna’ focus on.” Mr. Paltzer and Duellman, the team’s coaches, make sure that you go at your own pace depending on your skill level, and take your time to work yourself up to the level that will be needed during track meets. The club is a great way to work well with others and get better at running shorter and longer distances altogether. If you are interested with running in competitions and improving your endurance, track starts up in the spring season and meets up every day after school. 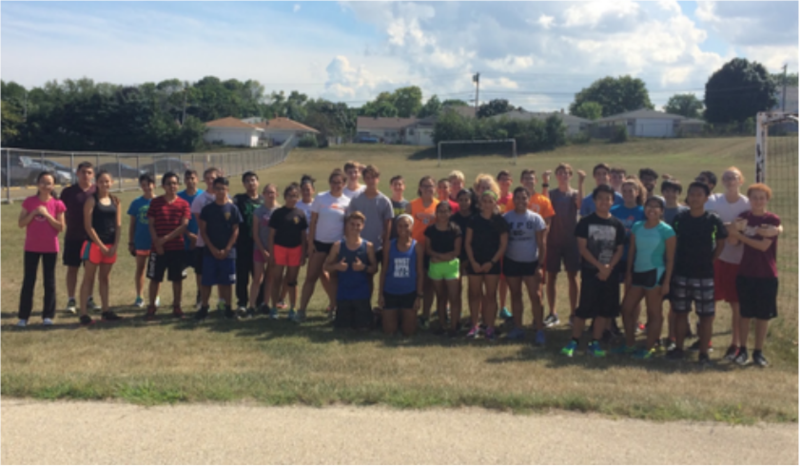 A new school year means a new Cross Country season. Whether you’re a runner or not, joining Cross Country will be something you won’t regret. You’ll get in shape, and make some great friends in the process. Reagan’s 2016-2017 Cross Country team. This year, the Summer Olympics were held in Rio De Janeiro, Brazil from August 5th through August 21st. TEAM USA did not let us down! Walsh Jennings, alongside April Ross from the women's volleyball team, lost the semifinals, but came back and won bronze medals! GO USA! The women’s gymnastic team, who named themselves the “Final Five” included Simone Biles, Aly Raisman, Madison Kocian, Laurie Hernandez, and Gabby Douglas who blew everyone away with their amazing talent. Simone Biles won her first Olympic gold medal on August 9 in the gymnastics team event. Later she won gold in the following events: women’s vault, women’s team all-around, women’s floor exercise, and the women’s individual all-around! Another amazing gymnast was Laurie Hernandez who is only 16 years old; she won a gold medal in the women’s team all- around and a silver medal in the women’s beam! They are both strong influential women, who have left a mark on many hearts by proving that if you work hard towards something, and are passionate about what you do, that you too can achieve anything that you want! To all the young girls who want to do reach a goal of theirs, but are afraid they won’t get to where they want to go, these two young ladies have shown us all that practice, and hard work can lead to great achievements!